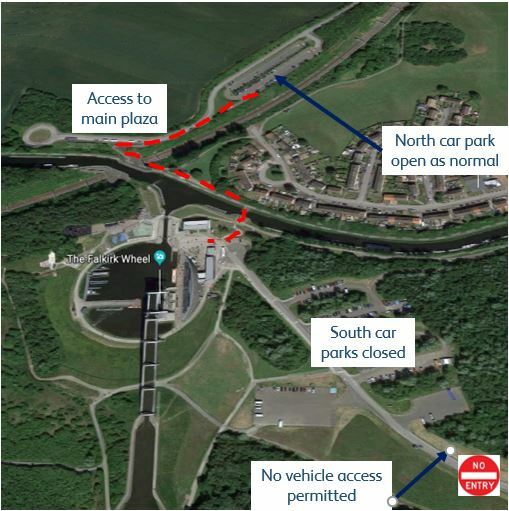 To improve visitor access to The Falkirk Wheel, we are planning to undertake upgrade and improvement works to the main access road. The works will result in a temporary closure of the south access road and car parks to all vehicles. Pedestrian and cyclist access will be available via a diverted route, see below. The closure will be in place from Monday the 4th of February until Friday the 22nd of March. The visitor centre will be operating as normal during this time. During this time visitors should use the north car park when visiting the site. Buses will use the bus stop at the top turning area during this temporary closure.